Pope Francis is spot on when he points out that climate change is a global problem with serious, palpable consequences in various areas. 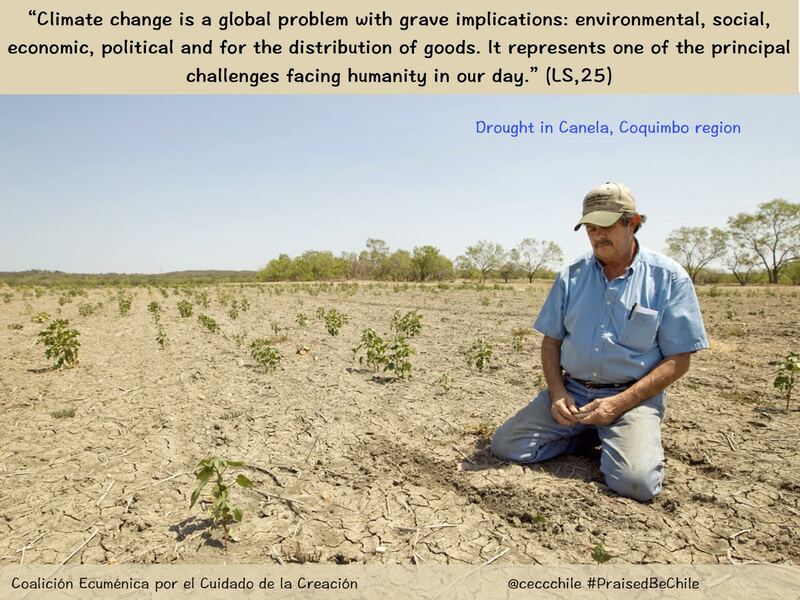 In our own continent several countries, including Chile, fall within the category of being extremely vulnerable to the effects of climate change. Climate change is the phenomenon of increasing average global temperatures, due to the increased concentration of greenhouse gases in the atmosphere, primarily caused by the burning of fossil fuels, the engine behind the existing model of growth. This phenomenon has the capability to cause droughts and rains to become ever more intense and prolonged, which causes serious environmental and economic problems among communities. An example of this is what is happening in the Norte Chico region, which has been suffering from drought for the last 8 years, while rainfall in the central region of Chile has become less, but with more intense downpours over a shorter period. The rain that falls, almost aggressively, causes floods in towns throughout the central region. The fluctuation of weather patterns affected the southern region this year, leaving thousands of hectares unfit for grazing, causing economic losses for farmers and rancher by not having fodder for their animals, nor water for irrigation. Another fact, according to the National Oceanic and Atmospheric Administration (NOAA) in the United States, is that June and July 2015 have been the warmest months on record, considering this is in the full of winter in our region. Climate change, in turn, has the distinction of not being noticed as much in larger cities where it is more difficult for services to be cut. But Santiago, which is fed from meltwater, is not far removed from what happened to Sao Paulo, where the authorities were forced to restrict water use for power generation due to a severe drought last summer. Santiago could have the same fate if nothing is done to stop the meltwater due to climate change and the major threat caused by mining. According to the national environmental authorities, Santiago will decrease water availability by 30% to 50% before the year 2050. And according to Aguas Andinas, its reserves are only enough to supply water for human consumption until the winter of 2016. All these impacts due to the effects of climate change, such as water shortages, changes in rainfall, the rise in sea temperatures and flood damage are examples of the various negative effects that Chile should take control of now and into the future, because all scientific data indicate that these current problems will become ever more frequent. That is why the action plan against climate change must be decisive and bold in doing whatever needs to be done in order to avoid an even worse scenario than that which we are currently experiencing. Spread and share this information !! Esta entrada fue publicada en Sin categoría y etiquetada Canela, Chile, climate change, Coquimbo, drought, global problem, praisedbe. Guarda el enlace permanente.